Random House Audio, 2006-04-04. Audio CD. Very Good. Clean CD's and playing great. Ships promptly. "I rehabilitate dogs. I train people." 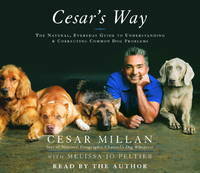 --Cesar MillanThere are at least 68 million dogs in America, and their owners lavish billions of dollars on them every year. So why do so many pampered pets have problems? In this definitive and accessible guide, Cesar Millan--star of National Geographic Channel's hit show Dog Whisperer with Cesar Millan--reveals what dogs truly need to live a happy and fulfilled life. From his appearances on The Oprah Winfrey Show to his roster of celebrity clients to his reality television series, Cesar Millan is America's most sought-after dog-behavior expert. But Cesar is not a trainer in the traditional sense--his expertise lies in his unique ability to comprehend dog psychology. Tracing his own amazing journey from a clay-walled farm in Mexico to the celebrity palaces of Los Angeles, Cesar recounts how he learned what makes dogs tick. In Cesar's Way, he shares this wisdom, laying the groundwork for you to have stronger, more satisfying relationships with your canine companions. Cesar's formula for a contented and balanced dog seems impossibly simple: exercise, discipline, and affection, in that order. Taking readers through the basics of dog psychology and behavior, Cesar shares the inside details of some of his most fascinating cases, using them to illustrate how common behavior issues develop and, more important, how they can be corrected. Whether you're having issues with your dog or just want to make a good bond even stronger, this book will give you a deeper appreciation of how your dog sees the world, and it will help make your relationship with your beloved pet a richer and more rewarding one.Learn what goes on inside your dog's mind and develop a positive, fulfilling relationship with your best friendIn Cesar's Way, Cesar Millan--nationally recognized dog expert and star of National Geographic Channel's hit show Dog Whisperer with Cesar Millan--helps you see the world through the eyes of your dog so you can finally eliminate problem behaviors. You'll learn:- What your dog really needs may not be what you're giving him- Why a dog's natural pack instincts are the key to your happy relationship - How to relate to your dog on a canine level- There are no "problem breeds," just problem owners- Why every dog needs a job- How to choose a dog who's right for you and your family- The difference between discipline and punishment- And much more!Filled with fascinating anecdotes about Cesar's longtime clients, and including forewords by the president of the International Association of Canine Professionals and Jada Pinkett Smith, this is the only book you'll need to forge a new, more rewarding connection with your four-legged companion.Also available as a Random House AudioBookFrom the Hardcover edition.